The A360X may just sound like an incremental upgrade to the current A360; it is so much more than that. Kessil completely threw out the old design and went back to the drawing board with the A360X. The A360X has a new design that is 30% smaller and packs in 25% more light output than the previous A360. To facilitate these changes Kessil has designed a new sunflower style heatsink that is more efficient while also having a smaller footprint. The sunflower design is also less likely to collect dust than the traditional heatsink design. DiCon Fiberoptics (the parent company of Kessil) has created a new dense matrix LED array that provides the additional light output while also adding new color channels for additional spectrum control. The A360X will also support Kessil’s new control interface called K-Link. K-Link is a revolutionary new digital control interface from Kessil that allows for grouping of lights. This means that you can have multiple lights running different spectrums and intensities simultaneously. This is an especially helpful feature when trying to create a sweeping sunrise and sunset effect, or if you have areas of your tank that require more PAR. The K-Link control interface now allows for operation at intensities as low as 1%. The ability to run at such a low intensity also means that the A360X can be used for Lunar simulation. Kessil will be offering two optical modifiers for the A360X. Similar to the diffusers for the AP700, the A360X will support a diffuser as well as a collimator that will reduce the angle on light producing a more concentrated cone of light ideal for deeper tanks. Kessil will be releasing a few accessories alongside the A360X such as a new spectral controller and WiFi module. The Spectral Controller X will be compatible with K-Link and the new features that come along with it such as individual fixture control. The WiFi module will allow for K-Link control from a smartphone with the K-Link app. 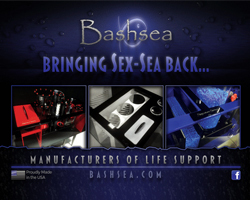 For more information on Kessil products please visit the Kessil website.